Perth Marathon 2012 on youtube has me in it at 13/14 seconds and 46 seconds. Thanks to Dennis Tan again for another brilliant photo. This one is about 40km into it, just going through the motions a bit by now getting to the finishing line. Well I had some fun today with my 9th Perth adventure. As Deek once said if you want to experience life run a marathon...or something like that. As has often been the case I got too close to the front of the crowd at the start line, and in my quest to get out of the crowd, as the adrenaline fired up with the excitement of racing with such a bunch of legends again (and in the knowledge that you never know when the body might breakdown on you), I realised when Clown spoke to me that I probably wouldn't be able to resist the urge to get off to a brisk start again. So I made sure I hit the lead early and put the foot on the accelerator and didn't let up for a minute or two. Noone went with me this year so it was a serene moment out the front early on, and the gap must have been at least 20metres maybe more... Dropped down a few gears to cruise into 1k in 4.03, but the next K was 4.55, and from there on it was a bit heavy weatherish today. Just didn't have the spark I have had in some other races. Tried to settle into a good pace, and unfortunately my hopes of holding some 4.30's early on today was not really happening, and 4.45-4.50's was feeling like the right pace....Drank a litre of juice last night which was probably yet another bad move in my many many "how not to prepare for or run in a marathon" saga... I think this is why I had to visit the toilets on the course a few times becasue I was very overhydrated....So that cost me a few minutes in time and probably made me less attacking made rhythm hard to find. 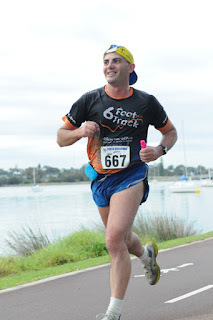 Got to 6km in 28.30 (right on 4.45 pace), and 7km in 33.19 which were both ok times, but nothing incredible. Half marathon was 1.49, which again although not what I had aimed for, was still keeping me on 5.15 pace so I figured I still had a small chance of holding onto a 3.50-4.00 marathon if I could keep the rest of it in the 5.30-6min or quicker K pace zone. I knew due to poor training and the fact I am a big positive splitter in all my marathons so far that would be a big ask...Already felt disappointed that 3.30-3.40 or better was going to be out of reach, but I guess thats all I deserve with poor training...Tried to ignore the concrete and try and keep the momentum ticking over. Was able to do that for a fair way, and get through a few bad patches without losing too many minutes. Got to 25k in 2.14, and while I was about 7-10minutes off the pace I held at Melbourne last year, was still in the PB ballpark just. 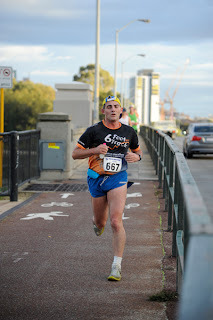 Had some 4.50-5.30 K's but then struggled getting to the Strand, and lost rhythm due to getting small debris out of shoes...Was able to keep finding a little bit of intensity (although I think I ran the Bunbury Half much stronger at times than today) and made it to 30km near Raffles in 2hrs 42min 29secs. 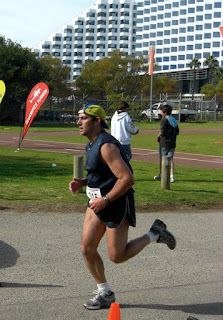 I knew I was still a fair bit off the pace,as Melbourne last year I got to 30km in 2hrs 30, in 2004? I got there in 2hrs 28min?, and pre-race I was hoping to try and get to 30km in 2hrs 20...I knew it was going to be hard to hold onto 6min per K or better throughout the last 12.2km at this stage of the race. Was able to do it for 3km and when I got to 33km in 3hrs00min 30 secs and I only had about 3km to go to get to Narrows, the boost from the gel at Raffles had helped, and I was starting to think maybe something about the 3.54 mark and a small PB might be just possible. Then I started to seize up/cramp up...The next 1km was a shuffle, then about 34km-35km my hip got sore, and running of any kind had suddenly become very painful...my experience told me I just had to find a way to get through the soreness, and get going again...and I struggled on but I could see the PB slipping away as my K times slipped out to 7-9minutes, and for awhile I had so little intensity available. GTTP's sub 4hour juggernaut came past just before the Narrows bridge...I really wanted to try and go with him but had nothing to dip into...Got drinks, and after some soul searching walk/shuffle stuff finally started to get going again after about 37km, although the temptation to just go back to a walk was strong, and I did that a fewtimes...I knew the PB was out of reach and that even a sub 4 hour run was going to be probably just a few minutes too hard. A few people I know caught me in the next few K's and with a few chats, started to find some momentum again. 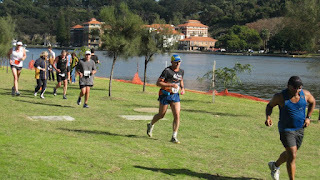 From 35km onwards my motivation had dipped bigtime and I was still struggling to see any reason to finish hard at 39km. 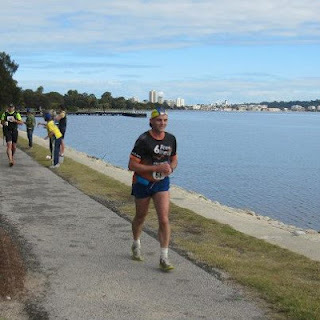 Thanks to Dennis Tan again for this photo I'm struggling to get going again here at about 37km just after the Narrows Bridge drinks stop. Bloke in blue top is not in the race, I don't think he has a race number but good on him for getting out for a run along the river. 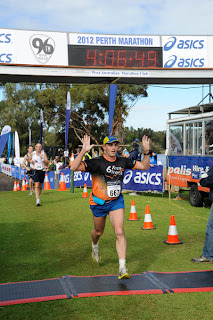 Holding up 9 fingers to symbolise the 9 consecutive years I have finished the Perth Marathon. Thanks to God for that! Although it wasn't what you wanted, still a solid time and fun race by the sound of it. Like how you broke out to an early lead! Get on TV? I know a lady who ran - Keren 4:01 - she would have picked you up in the last 5k. Anyway, have a good recovery. 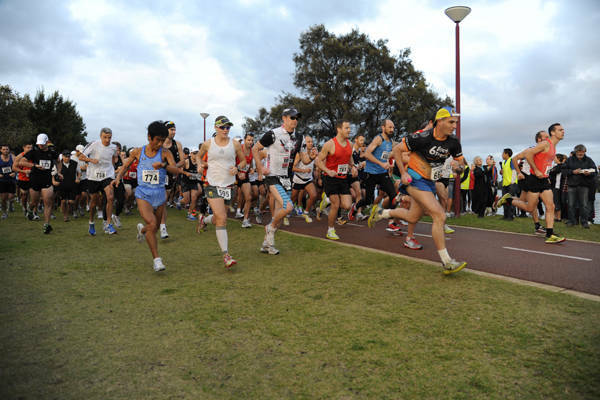 Me thinks you need a concerted training effort to celebrate your 10th by running a PB!